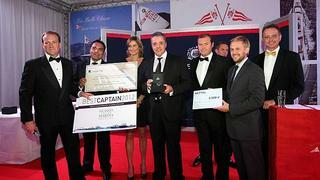 At a ceremony in Monaco last week, Fraser Yachts named their charter captain of the year as Captain Takis Tsakos of the 45m motor yacht Ionian Princess. The yacht has had a very busy summer and all the charters that have been completed were a resounding success. In one instance, Ionian Princess was chartered as a 'tender to' an 85m yacht for 10 days. They were due to look after the staff while the main guests chartered the bigger 85m yacht.